CALGARY, ALBERTA--(Marketwire - Feb. 3, 2012) - Alhambra Resources Ltd. (TSX VENTURE:ALH) ("Alhambra" or the "Corporation"), an international gold explorer and producer, is pleased to announce the completion of 1,360 square kilometres ("km2") (Phase one) of ground gravity and magnetic surveys and a remote sensing survey over the Dombraly-Shirotnaia gold trend located in the southeastern portion (see News Release dated September 27, 2011) of its 100% owned, 9,800 km2 Uzboy Project area ("Uzboy Project") (see Figure 1). It is anticipated that Phase two, potentially covering the remainder of the Corporation's license area, will commence in 2012. An ASTER imagery survey to locate areas of hydrothermal alteration associated with the style of gold mineralization known to occur in the region, as well as prospective tectonic features, was also completed. Mr. John J. Komarnicki, Alhambra's Chairman and Chief Executive Officer stated, "The recently completed surveys are the first step in evaluating the gold potential of Alhambra's licenses. 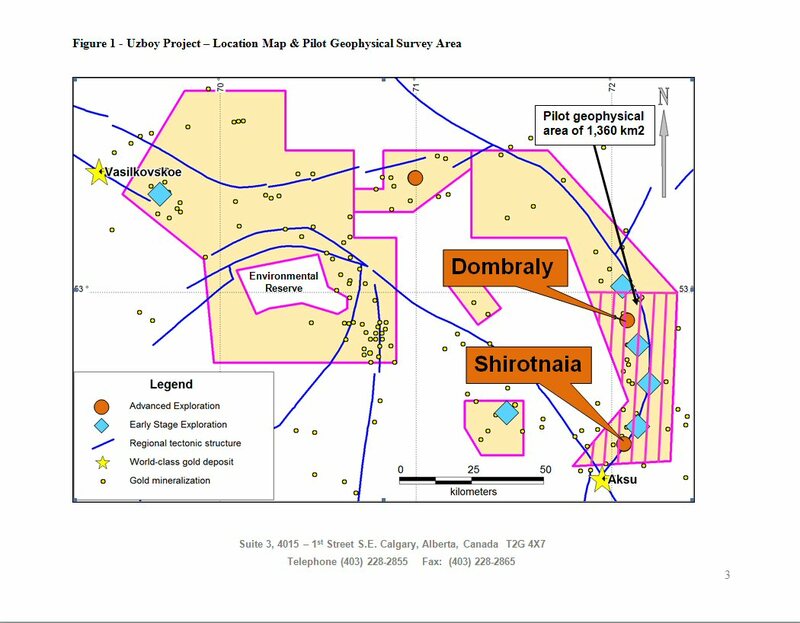 The exploration results to date from the Dombraly-Shirotnaia gold trend combined with the Uzboy gold trend demonstrates the gold potential of Alhambra's licenses to host large gold deposits. The data from all three surveys is currently being interpreted which is expected to be completed in April. The results of these surveys will be incorporated in our 2012 exploration plans for this area, including drilling." The objective of these surveys was to gain a better understanding of the structural and alteration signatures for the known zones of gold mineralization and use these to locate new targets for exploration. Figure 1 shows the location and areal extent of the surveys recently completed over the Dombraly-Shirotnaia gold trend. The magnetic and gravity surveys were conducted along a 1.0 by 0.1 km grid and 1.0 by 1.0 km grid respectively. The surveys were completed by Azimut Energy Services, a leading supplier of geophysical services to the mineral industry in Kazakhstan. The objective of the ASTER imaging survey was to identify areas of hydrothermal alteration typical of gold mineralization and the structural controls on the alteration including faults and fracture zones. Elmer B. Stewart, MSc. P. Geol., a technical consultant, is the Corporation's nominated Qualified Person as defined by National Instrument 43-101, and has reviewed the technical information contained in this news release. Alhambra common shares trade in Canada on The TSX Venture Exchange under the symbol ALH, in the United States on the Over-The-Counter Pink Sheets Market under the symbol AHBRF and in Germany on the Frankfurt Open Market under the symbol A4Y. The Corporation's website can be accessed at www.alhambraresources.com. Certain statements contained in this news release constitute "forward-looking statements" as such term is used in applicable Canadian and US securities laws. These statements relate to analyses and other information that are based on forecasts of future results, estimates of amounts not yet determinable and assumptions of management. In particular, statements concerning the anticipated geophysical surveys, and other factors and events described in this news release should be viewed as forward-looking statements to the extent that they involve estimates thereof. Any statements that express or involve discussions with respect to predictions, expectations, beliefs, plans, projections, objectives, assumptions or future events or performance (often, but not always, using words or phrases such as "expects" or "does not expect", "is expected", "anticipates" or "does not anticipate", "plans, "estimates" or "intends", or stating that certain actions, events or results "may", "could", "would", "might" or "will" be taken, occur or be achieved) are not statements of historical fact and should be viewed as "forward-looking statements". Such forward looking statements involve known and unknown risks, uncertainties and other factors which may cause the actual results, performance or achievements of the Corporation to be materially different from any future results, performance or achievements expressed or implied by such forward-looking statements. Such risks and other factors include, among others, the ability to discover new gold deposits as a result of the geophysical surveys completed, the availability of capital to fund future exploration programs; political, social and other risks inherent in carrying on business in a foreign jurisdiction and such other business risks as discussed herein and other publicly filed disclosure documents. Although the Corporation has attempted to identify important factors that could cause actual actions, events or results to differ materially from those described in forward-looking statements, there may be other factors that cause actions, events or results not to be as anticipated, estimated or intended. There can be no assurance that such statements will prove to be accurate as actual results and future events could vary or differ materially from those anticipated in such statements. Accordingly, readers should not place undue reliance on forward-looking statements contained in this news release.